We had some unused airline credits with Royal Jordanian from our cancelled trip to Egypt. When we thought of using these credits, we realized that Royal Jordanian mostly flies in and out of Jordan. So, we decided to pay a short visit to Jordan. Day 1: Arrive in Jordan. Transfer to Petra. Day 2: Spend the entire day visiting Petra. Day 3: Drive to Israel border. Stop at the Byzantine church, promised land to the Moses and the baptism site. Drive to the Dead sea hotel in the afternoon. Day 4: Drive to Amman and fly out. Our only choice was Amman. Queen Alia International Airport (AMM) is a bit outside the city of Amman. We traveled in December. The snow storm had just passed. It was cold and windy in Petra and Amman but absolutely pleasant near the Dead Sea. Magnificent and truly spectacular. We started at 7 am in the morning. Our guide walked us to the main entrance and kept talking about the history and significance of Petra. I was excited to know that Petra comes from the work "pathar" in Hindi or vice versa! and Wadi Musa stands for Valley of Moses. We walked through the sandstone canyon, Siq for about an hour or so to arrive at the treasury, Al Khazaneh, the most photographed spot in Petra. It is amazing how these structure were carved out in the rocks. One advantage of coming early was that we had the place to ourselves. We took a lot of pictures with no tourists photo bombing them. We continued on to the amphitheater through the Street of Facades. 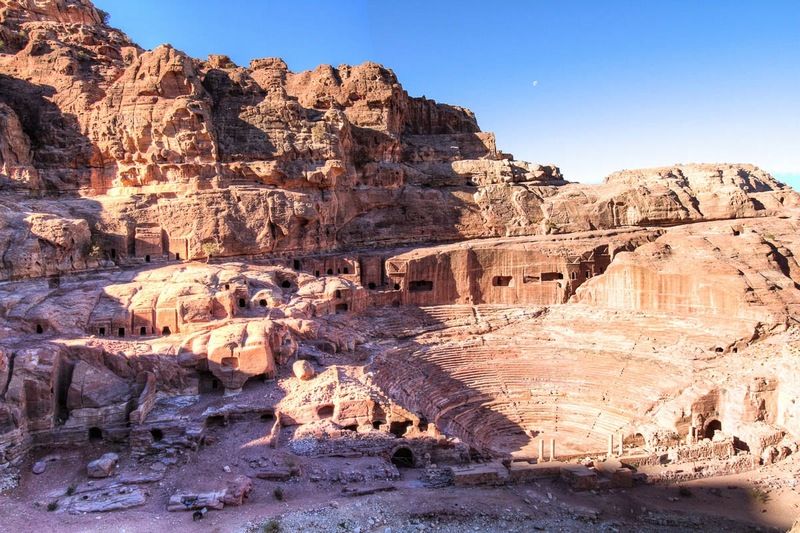 Amphitheater was built by the Nabateans, but had a roman feel to it.We kept walking through the royal tombs and many other structures till we reach the trail head for the Monastery. We could have hiked up to the Monastery, but were too lazy and decided to enjoy a mule ride. It was fun and scary as the mules climbing along the steep edges and I was just hoping that they don't slip. My prayers were answered and we reached to the Monastery safe and sound! Monastery is much more prettier than the Treasury in my opinion. We spent some time here resting and taking pictures. Walked for another 5 minutes to another beautiful vista point. We walked back to the trail head and had lunch at the restaurant. It was leisurely walk back to the entrance and to the hotel. There were a few more hikes in the ruins that looked pretty interesting. But we were jet lagged and decided to skip it. We were back by 3 pm. We totally skipped Petra by the Night sound and light show as we have seen quite a few of them and they aren't much different from each other I feel. Their website. Madaba is a city close to Israel border and dead sea. It is around 2 hours south-west of Amman. 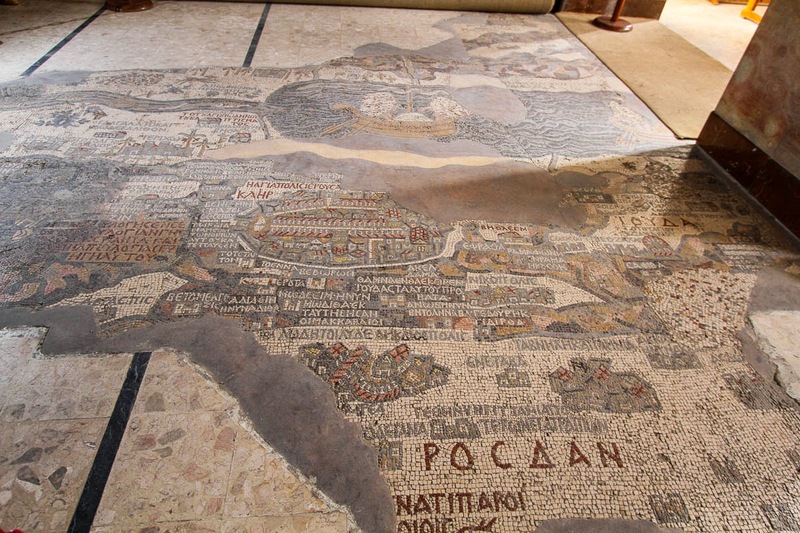 We visited the Byzantine church which has a 6th century mosaic map of Palestine. Some beautiful mosaic works inside this small church. It was Christmas the day we were here, so the city was all decked up for the day. 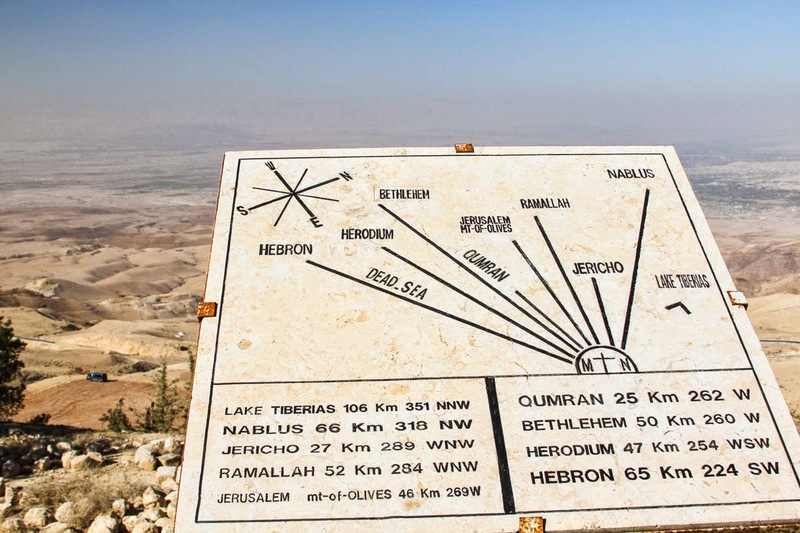 We then went to Mount Nebo. This is where you can the land promised to the Moses. Pretty site. We could see Jerusalem and Jericho from here. Then we headed to the Israel border to visit the Baptism site. There are small buses that take you for a guided tour of the site. They leave the bus stop every 30 minutes or so. It was very hot and we had to get rid of our sweaters. Interesting places with interesting history. So much so that we got back to our hotel and searched internet to read in detail all about Moses and Abram. We got to our hotel late in the afternoon. 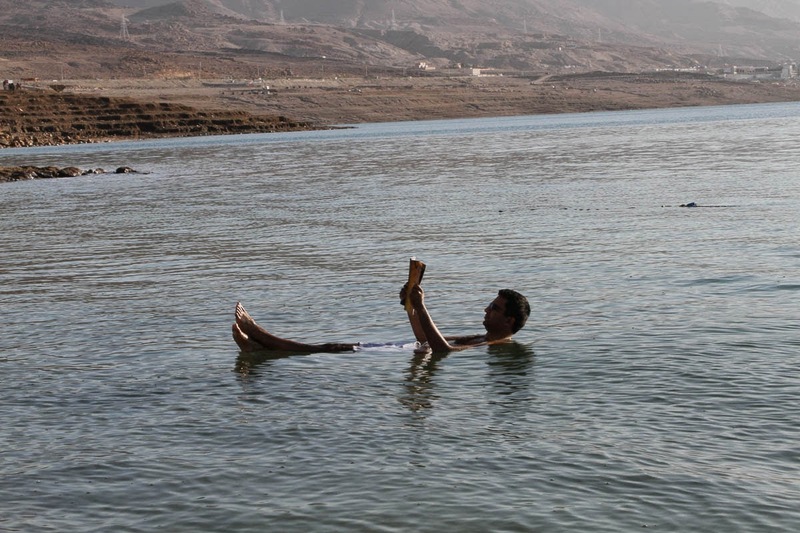 Went to the dead sea and just floated. It feels weird how you can effortlessly float in this water. It looks viscous and leave salt residue on your body once it dries up. Of course you have to be careful and not go too far or try to swim or drink this water. We scrubbed ourselves with the dead sea mud/minerals and it is the best spa I have had! All the tan just vanished. 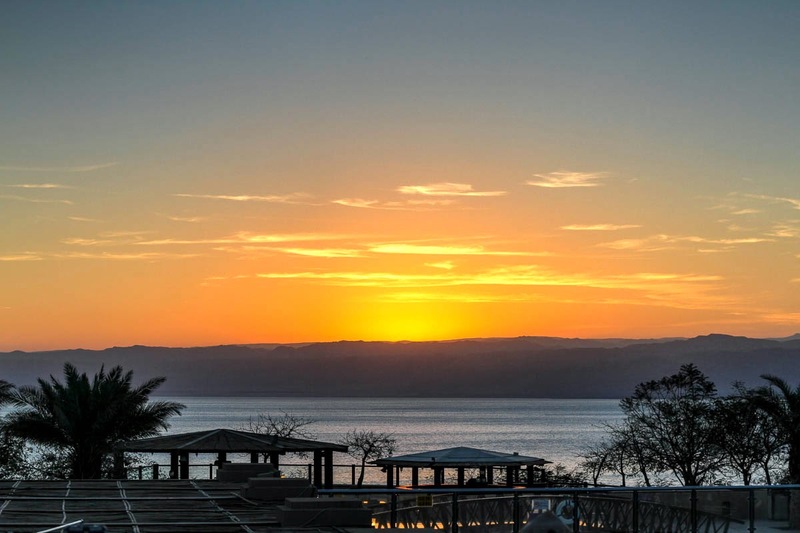 Once we were done with all the dead sea fun, we spent time watching the sunset! Spend a day at a resort and go sea diving in the Red Sea. It is one of the best places to go sea diving at I hear. This will be helpful. Jordan has some really beautiful trails to offer for hiking enthusiasts especially close to Wadi Rum.. It wasn't on the cards for us as we as usual were on a time crunch. But you may want to explore this option. This is a useful resource I had found. We stayed at the Petra Guest House right outside the ruins entrance and at the Holiday Inn near Dead Sea. There are other fancier resorts by the dead sea. The ones we stayed at were pretty good too. Absolutely no issues finding good food. Falafals, hummus and Pita bread were in abundance for veggies like us. There was a particular falafal sandwich place in Madaba which had the best falafal sandwiches I have ever had. Sadly, I do not remember the name. 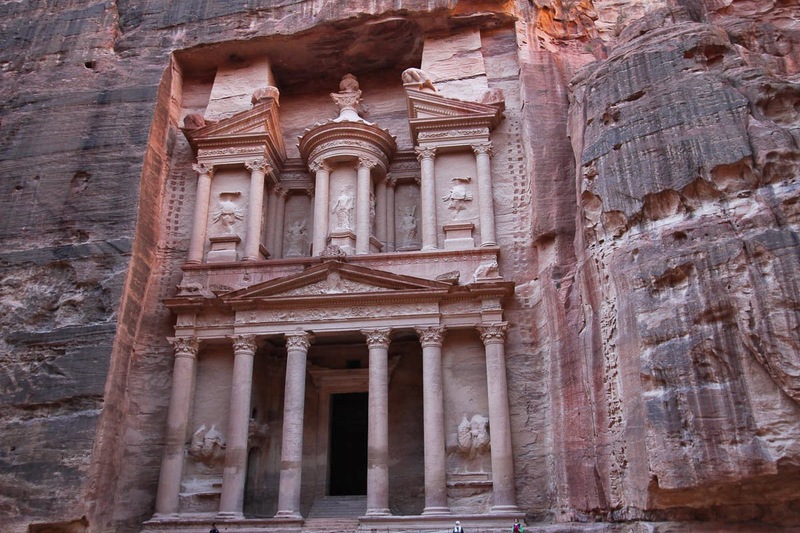 We had booked a two day tour with Petra Night Tours. I would recommend them. We were in a nice brand new car with wifi in it. Very comfortable and convenient plus a friendly guide. I would however do it on my own the next time. I know of some friends who had rented a car and driven around themselves. Jordan has a very low crime rate and driving around did not look difficult at all. So if you can drive around, this should be your pick. Getting a visa wasn't very cumbersome, but a long process. I don't really trust visas on arrival concept, so we had sent in our passports to the Jordan Embassy in DC. They took a while to process it and we had to go back and forth a couple of times, but it took around 3-4 weeks for us to get our visa. People were super nice, friendly and welcoming. It was amazing to see how much they respect the royal family. We saw pictures of the beautiful royal family almost everywhere. The queen especially has a great following and promotes the handicrafts and other artworks enthusiastically it seems. Our driver knew about Mithun da and Amitabh Bachhan as he had seen a lot of their movies in his twenties. Bollywood has quite a reach.